A Van Gogh in your bag on your desk! 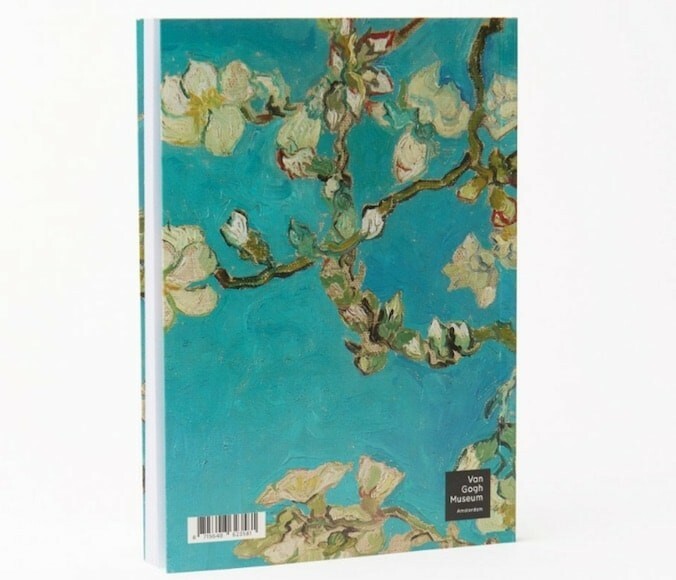 This A5 notebook has a special cover print is special: a fragment of Vincent van Gogh’s masterpiece ‘Almond Blossom’. 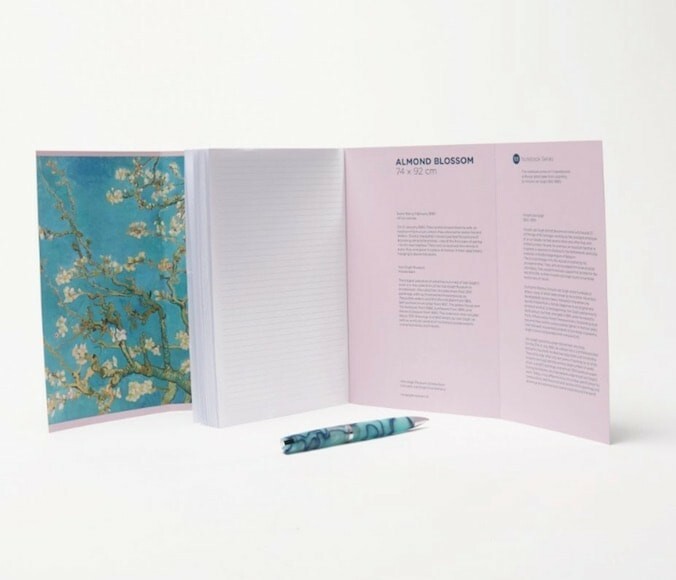 The notebook has a hard cover, a print of the complete painting on the inside and lined pages. Beauty meets practicality! Although most people have laptops, Ipads, and smartphones, a lot of us still want to pencil notes in a notebook, that is a paper notebook. Very convenient to have one in your bag. And like other personal accessories, it’s nice to have an attractive notebook. One that you enjoy every time you put it in front of you. 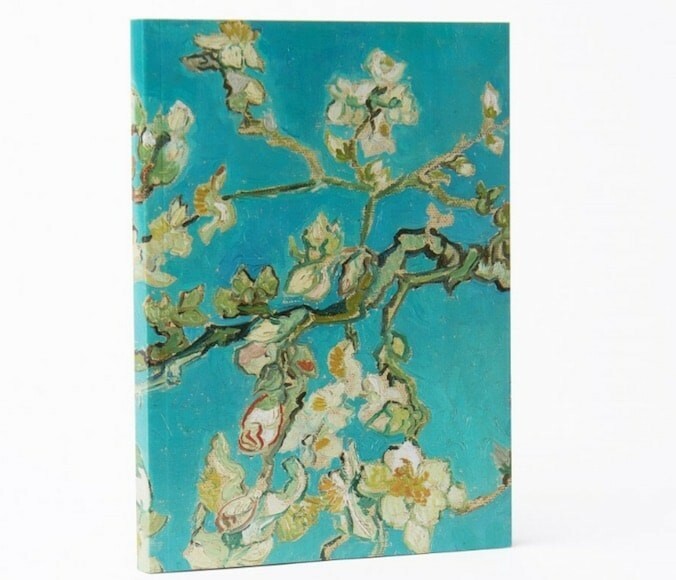 This lined notebook has a cover print of a fragment of the famous Almond Blossom painting by Vincent van Gogh and on the inside a picture of the whole painting. 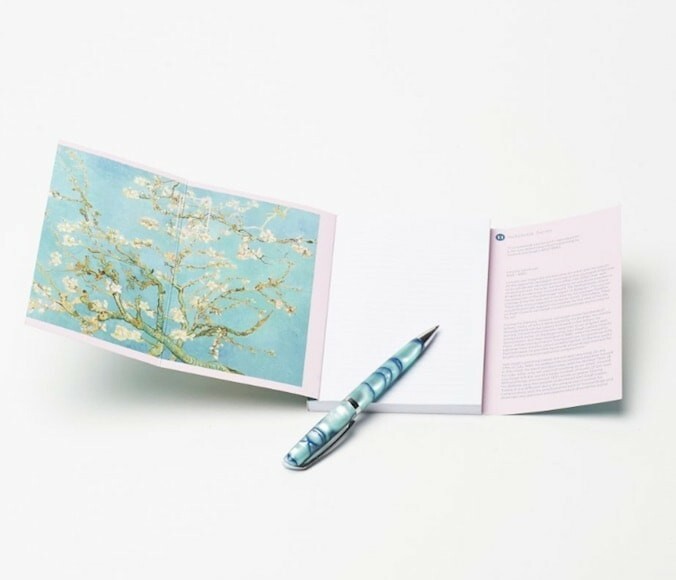 Pretty unique as your personal notebook but also a great gift! Van Gogh painted this sparkling still life of delicate almond blossom against a clear blue sky for his newborn nephew Vincent Willem. The subject, as well as the sharp contours and placement of the tree, was inspired by Japanese prints. Vincent van Gogh has bequeathed a huge amount of paintings. Fragments of a number of masterpieces have been used to decorate products like scarves, bags, glasses cases, vases, bicycle bells, umbrellas, puzzles and more. In our webshop, we have dedicated a whole subcategory to Vincent van Gogh items. Van Gogh was born in the Netherlands and later went to live in Paris and other places in France. He did not have such a happy life and people in his lifetime disliked his beautiful paintings. In all his life, he managed to sell only one of his paintings. He earned no money and remained forever dependent on his parents and brother Theo. He takes to drink and is eventually admitted to a psychiatric hospital. He then decided to fully concentrate on painting. On July 29, 1890, Vincent van Gogh dies, leaving behind more than 850 paintings and almost 1300 works on paper.